I am well into my recovery now. Yesterday I ran for the first time since WS and everything felt good. Western States had been my main focus for racing in the 1st half of 2007. Now that is behind me, it is time to move my focus to the remainder of 2007. Priority #1 is the same as ever, have as much fun as possible with as many of my friends as possible and run with as many beautiful ladies as I can. The rest of the summer will be very low-key with couple of no-fee fun run 50k's in July. 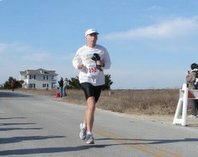 August and September will all be training aimed at exceeding my mileage at the Hinson Lake 24 hour run Sept.29th. After recovering from that I will get back into marathon training mode and try for a Boston Qualifier at the Richmond Marathon on November 10th. I don't expect to run Boston next year but this race falls into the qualifying period for 2009 and I would like to get that out of the way so I can concentrate on a full schedule of ultra's in 2008. Stay tuned for more details. Well, you had to go and ask didn't you? If you had asked me last week the answer would be different but after my first run this week I decided I must put my name in the hat for the WS lottery next year. I plan to run Umstead for sure and go for a PR. Then if I get into WS it will probably be my only other one. If I don't get into WS, I will be doing Massanutten and also entering the lottery for Wasatch. If I don't get into Wasatch then I will return to Vermont and redeem my only other DNF. Did you get all that? If I win the lottery I will do all of them. And if you win the lottery (Mega Bucks - not WS100), I'll be HAPPY to crew!